Minimum 18 years old. Must be current ACA member. Ability to pass a L2 skills assessment. For those looking to become a Stand-Up Paddleboard Instructor. Level 1-2 is flatwater based. The main focus is on progressions from basic to advanced maneuvers. Safety and rescue techniques are also covered. The American Canoe Association (ACA) is a national organization dedicated to promoting paddlesports education. To learn more, visit their website at www.americancanoe.org. Minimum 18 years old. Must be current ACA member. Must be currently certified as a L2 Instructor and able to pass a L3/L4 skills assessment. For those looking to teach SUP on the river. Must have basic understanding of river hydrology and able to move in and out of current. Maneuvers need to be performed in both regular and goofy stances. Salida river park. Class II section. Minimum 18 years old. Must be current ACA member. Must be currently certified as an L4 Instructor and able to pass a L5 skills assessment. 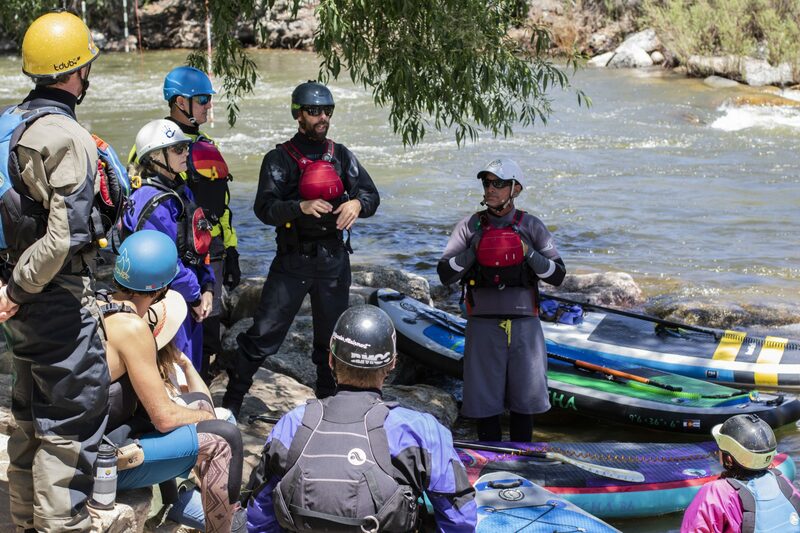 For those looking to teach SUP on the class III Whitewater. Must have solid understanding of river hydrology and able to perform maneuvers in regular and switch stances while on class III features.